Impression is that nothing about Apache has crossed their own desk yet because it doesn’t appear to get a mention. They’re calculating something that crossed my mind. This has the capability of bankruptcy beyond anything fathomable when it comes to potential fines levied. Hi Cindy Sue,… sorry to have sent you back to the 60’s. Actually, the Mighty Carnac was still going into the 80’s. You don’t have to go back THAT far. ps: thanks for the “favorite read” comment. We love getting that kind of feedback. I am about to publish another bit that points back to Brian’s article and covers the timestamp as PIN controversy (as soon as I confirm it). This dumpster fire is so bright the ISS crew is having to break out the shades. The real Edelman would never drop the ball, give up an interception, and would fix his errors immediately. Nope, this reeks of a Peyton Manning pretending why he has no idea how his wife received his growth hormone. Before you call the Patriots “cheats” maybe you should add some examples ( that haven’t been debunked). BTW ESPN has never admitted lying about deflategate. You people are just jealous! Pboably voted for the Dumpster – how’s that working out for you? What much of this points to is something I have believed for years: The best protection against identity theft is to have a terrible credit rating. Believing corporate America can secure this data is like believing you can domesticate wild tigers for pets. Sooner or later, you’re going to get bit. At least with poor credit, you beat the bad guys to the punch. Sure, the other side of that is credit rates, but the message there is live in one’s means (not one’s credit rating). Long term, the solution is simple, start treating personal information as though it were copyrighted (you are the author of your PII after all, aren’t you?). 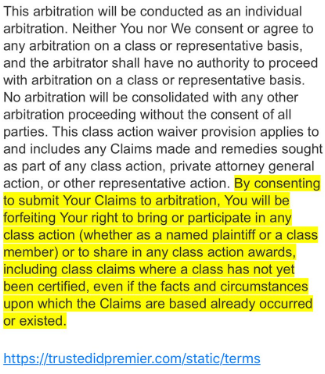 Anyone using it without consent (not to mention profiting) will be subject to civil liability. Fsb hands are on everything. Seems to me that Equifax should have to pay ALL the fees associated with Freezing/Unthawing of accounts. How is it that _they_ release all my info and then I have to pay to protect myself? They finally agreed to freeze and unfreeze for free. I expect Equifucks to go the way of Arthur Andersen very soon. I’m so glad to see the invisible hand of the free market did its thing it protecting the sensitive PII of Equifax customers. That is the thing. You are not the customer. You are the product. But what if the product becomes more expensive? 2. It will actually help you from getting your identity pwned. Yes it is $10 but cheap if they can no longer sell your data. There is no free market since the data owners don’t have a choice not use them. Where is the consumer bureau Obama and the Dems like Warren created? Nothing heard from them about the 6 the breach in 7 years. I looked through the site’s js and did some thinking. If the registration server is busy, you are not impacted. Otherwise you are. If you are not impacted there may be a special server response flag that will change that to impacted. If the server doesn’t respond at all (super busy?) you are not impacted. Honestly I don’t know why this logic is in js and not a view template to begin with lol. Fvcking assholes lowered my credit score after I used a CC to make $5K downpayment on a new car. Even though I NEVER borrowed a penny off the charge and paid $5K back right away JUST to have a $50 cash Back! A-holes Dropped my score 50 Fvcking points. Blow me credit raters and credit bureaus! Giving you a horrendously bad (for you) Utilization Rate of 90.9%. Bix, the credit bureaus didn’t do anything. YOU did it to yourself by your own admission. You said you used a credit card to make a down payment on a car. Then, you said you didn’t borrow any money. YES, you did – when you used the credit card to make the down payment. DUH! And, when your credit card balances increase or decrease, your credit score will likely change. That’s the way credit scores work. Again, DUH! Don’t blame someone else for your actions. I sent the credit card # they charged my card I received nothing call they said .I would get 50% of my money back and receive my pills. nothing !!!! These guys have played fast and loose with consumer’s most sensitive information for years. They do just up to the letter of the law, and work very hard to ensure that the laws are decades behind the times. Their response to this is telling, starting with the insider trader by execs to unload their soon-to-be-worthless shares, to hiding behind legalese, PR positioning, and a random-response website. If there was really a free-market choice, we could choose which agency reported on us. Who really has much trust in Equifax now? It wasn’t high to begin with, and it’s not going anywhere positive soon. Equifax isn’t even trying, as they don’t see it as germane to their business. It’s well past the simple explanation of “who are they beholden to”. It’s never been the consumer or small business. It’s is about who they can damage, and damage severely, through gross neglect and continued indifference. To my fellow Republicans who don’t believe that they can even discuss issues like this: markets can’t function without transparency and trust, credit isn’t extended when fraud is prevalent, and to personalize it a bit more, you will not win re-election when fraud and identity theft hits the majority of voters and costs them money. Totally agree – I’m not going to change parties any day soon, but I may have to go to a town hall meeting and punch someone representing me in the face! It’s the American way, isn’t it? We need to work inside our parties to change things; even if it means voting the bastards out every time they come up for election – even if it is the same party. This is the 6 breach in 7 years according to DOJ website and they say the company is doing what they have to. So buy the stock in 11 months beacauae many people getting the free monitoring will forget and the company will start charging them automatically. You need a cc # to sign up. There is no punishment for mismanagement of our data that we never control. We aren’t their customers so we can’t do much. I notified my do nothing senator. And haven’t heard anything. I thought the CFPB created by the Democrats was supposed to protect consumers. What a joke. The CFPB won’t necessarily be able to do everything you want until you file a complaint. There has to be proof of damage by the complaint system, so trot on over there and file a complaint! I’ve helped people do that, and it ALWAYS gets a response!! This is the 6 breach in 7 years according to DOJ website and they say the company is doing what they have to. So buy the stock in 11 months beacauae many people getting the free monitoring will forget and the company will start charging them automatically. You need a cc # to sign up. There is no punishment for mismanagement of our data that we never control. We aren’t their customers so we can’t do much. I notified my do nothing senator. And haven’t heard anything. I thought the CFPB created by the Democrats was supposed to protect consumers. What a joke. You can’t even put an alert on the account since you have to suspect fraud or have a police report. .You can’t even put an alert on the account since you have to suspect fraud or have a police report. And of course you can freeze you credit with each bureau but I believe it cost to unfreeze. I was able to put a freeze on my accounts at Experian and TransUnion, but when I went to Equifax they couldn’t process it online and wanted me to mail in all kinds of personal info, including my DOB and SSN. Like I’d put that in the mail to anyone, much less a company that let itself get hacked. Idiots. Is it time to go back in time….. paper files, snail mail, and cut the cord to the internet? Nothing is safe with a connection to the internet apparently. Waiting see this movement start up. Thank you for the ongoing expert commentary. In a previous post on this issue, you indicated that prior credit freeze information was probably not compromised but that you had no confirmation of this fact. Have you obtained additional information on whether or not prior credit freeze pin numbers were compromised? If so what is the quickest way to obtain a new pin number? Thanks again! Great questions about whether or not our pin numbers are outside the grab of the hackers. You are the first person I’ve seen bring this up. Does anyone have more information? I addressed this in a story the other day. If you can answer some really weak knowledge-based authentication questions about someone and you have their information leaked from the data included in the Equifax breach (which is also for sale in the cybercrime undergound) you can almost certainly get someone’s freeze PIN from Experian. I froze my credit and ran into a problem with the IRS website. When I logged on it told me I need to recertify my account, which I can’t do without lifting the credit freeze because they use Equifax. So I can’t see my transcripts or do anything online at IRS.gov. A golden parachute is usually the big payout an executive gets for leaving the company they’ve managed, often into a water-filled ditch. From what I understand, none of the three Equifax execs who sold large blocks of Equifax stock shortly after their company’s data breach was identified internally are leaving the company, so not really golden parachutes for them. Rather, it ‘s more properly called insider trading. I have no respect for this worthless firm. each time it said yes. Brian – thanks, as always, for the expert commentary. Many must be heeding the advice to initiate credit freezes… systems at Experian, Innovis, TransUnion and Experian. I tried this morning and was only successful with Innovis. Got system errors with the other 3 – likely a capacity issue. Anyway, just sharing with others who may be trying to do the same today … thank you! Addisen, why are not make a credit “freeze” a normal course of business????? Most consumers do not need to have their credit files open and if necessary simply have the consumer and the financial institution act in concert. This would sharply reduction credit fraud by the hundred-of-thousand. But then indolency is king. That’s exactly what I’ve been telling my congressmen! I only saw 29 signatures reported – what is it with that group? I think you’d be better off signing the petition CU is circulating, at least those participants can spell Equifax (instead of Equinox :p) Plus you don’t get put on any email spam list! I called into each number (for “credit freeze”) of each credit reporting entity and had no problems freezing credit on any of them that route, yesterday morning. …try calling. Have CC on hand to type in info. Hello, I am one of the people who like Brian received not a yes or no answer to whether my credit information was stolen. 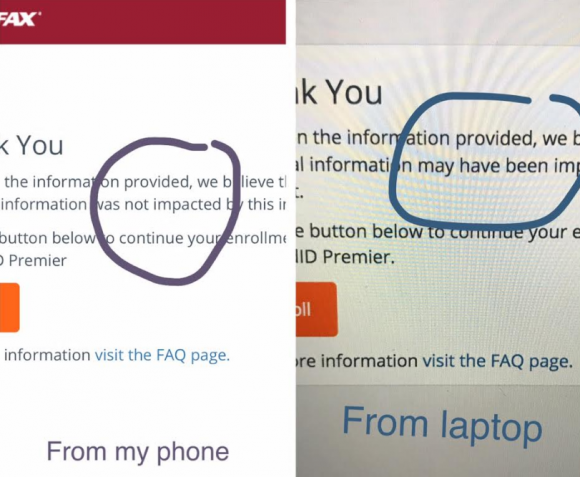 However when I went back today to complete registration it changed and now it says it was stolen: “Based on the information provided, we believe that your personal information may have been impacted by this incident.”. So you should check again if they don’t answer yes or no. A rare exposure of the oligopoly’s raw form of primitive capitalism. Aside from the sheer gall displayed by Experian, given their track record of magnitude data breaches, to now offer its “secure product”, it is quite instructive. Who says you can’t “quit this town” and get a new start with old management, in the same town, but with a new name? This is the USA! I was successful in freezing all four of my credit files this morning. Only Equifax seemed slow. Note that at the moment, Equifax is offering the freeze without a fee. and he won’t really answer anything. He will simply obfuscate, which is what these guys do for a lucrative living. I still don’t understand how they got all that info in the first place. I never remember giving them permission to have my SSN.